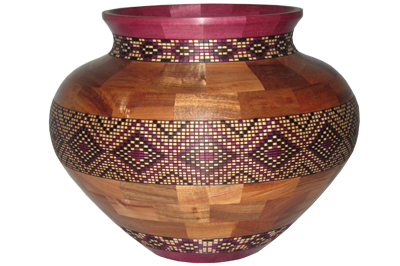 Large segmented vessel in koa and purpleheart, 710mm x 485mm dia. Can you briefly explain the type of work you carry out at present? As a production woodturner, I turn segmented woodturnings in various shapes and sizes, many of which are embellished with some form of pyrography. As a wood artist, I challenge myself with new forms and techniques and have teamed up with other artists to push ourselves out of our comfort zones. What is your favourite timber to turn? Koa (Acacia koa) and mango (Mangifera indica) are my woods of choice for most of my work, but not because of their ease of turning. Anyone who has turned koa will understand why I like to turn it. What are your current likes and dislikes within the sphere of turning? I like that the woodturning community are the most giving of individuals when it comes to sharing their time and knowledge. My dislikes would be subjective at best, so I will keep these to myself. What direction do you see your work taking in the future? In terms of the future, I hope to continue to collaborate with my artistic friends and to push myself to always strive for that illusive perfect form. In my opinion, it's all about form when it comes to turning. If you could only offer one bit of advice to someone starting out turning, what would it be, and why? Besides the obvious of finding a mentor and lots of practice, I would suggest they study form. My experience with new turners is that those with art backgrounds, who are familiar with good form, hit the ground running and are able to produce quality work with amazing ease. What music and which books are you currently into? I listen to a classic rock radio station when I'm in the workshop and tend to play more contemporary and Hawaiian music in leisure times. My reading habits these days tend to be focused on a daily newspaper, trade journals and the internet. Tell us about the piece you are currently working on. I am currently working on a Southwest shaped vessel with mosaic patterns burned and coloured on design rings of a segmented turning. A fun commission allowing me to revisit a technique I rarely do anymore. Which are your favourite items to turn? 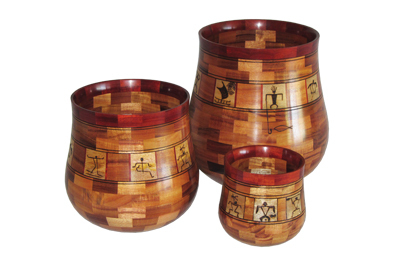 My favourite turnings and my best sellers are Hawaiian umeke and calabash forms pyro embellished with Hawaiian petroglyphs and Maile leis. It's a beautiful form when perfected, yet still challenging after having turned hundreds of them. Which turners do you most admire, and why? Although I admire many of today's talented woodturners, one turner immediately came to mind who tops my list. That would have to be my father-in-law who passed away in 1996 and indirectly brought me back into woodturning. I bought my first lathe while working with Newt Cutler in the early 1980s in Juneau, Alaska. I then left it with him in his workshop when my wife and I moved to Hawaii in 1984. I continued working in wood and started my own furniture and cabinet business. Back in Juneau, Newt became a segmented woodturner when few others even knew what a segmented woodturning was. 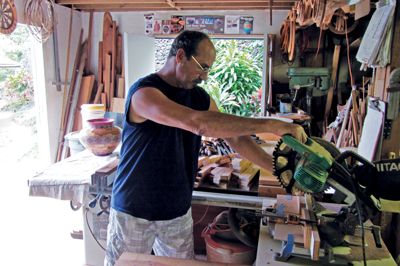 After his passing, I inherited his upgraded Woodfast from the Myford benchtop lathe and added it to my shop in Kona, Hawaii. It didn't take long before I was back turning and this time I was turning segmented vessels. My shop miraculously morphed into a woodturner's shop shortly after that, inspired by my father-in-law's segmented woodturnings. What do you think the best single development in turning has been? As a segmented woodturner I would vote for the four jawed chuck and all their varied jaw attachments. What do you see yourself doing in five years' time? In five years time, I see myself doing the same thing I'm doing now; cutting, gluing and turning. What do you see as the biggest thing that has hindered the development of woodturning in general? The lack of a more robust collectors' market to purchase all of woodturning's creative art. I have no regrets. My past, for good or bad, has brought me to where I am today and I love where I am.